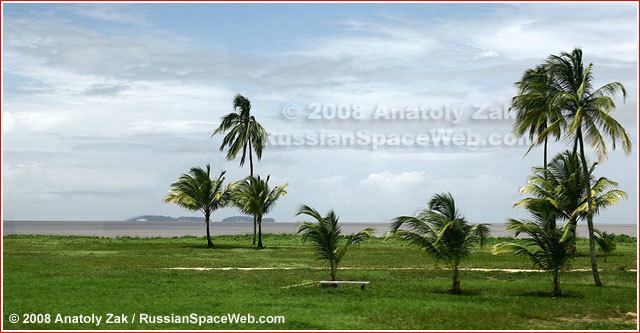 Kourou is a commune in French Guiana, an overseas region and department of France located in South America. In addition to being an administrative district in French Guiana, it is also the main town in that district. Within the Kourou district lies the Guiana Space Centre, France and the European Space Agency's main spaceport. Some 60 km (37 mi) northwest of the French Guyanese capital Cayenne the Kourou River empties into the Atlantic Ocean. At the mouth of this river sits the town of Kourou, which is ringed by four hills: Carapa, Pariacabo, Café and Lombard, with the Singes and Condamine mountains not far behind. There are three lakes within the town's city limits: Lake Bois Diable (where one can take lessons in jetski and other aquatic sports), Lake Marie-Claire (the smallest and calmest), and Lake Bois Chaudat (the biggest of the three; also open to sport lovers, especially canoers and kayakers). Long white sand beaches and some rocky outcrops line the town's ocean coast, the riverbank and all points inland consisting mostly of mangrove and dense tropical rainforest. The Saramaka mostly settled in the quartier Saramaka, along the river. Much of it burned down in a fire in 2006, and hasn't yet fully recovered. Guiana in general has a high level of crime compared to the rest of France's départements; Kourou has an average of two armed robberies a day. A march protesting the high level of insecurity felt by most of the population was held in Kourou on 27 October 2006. Shopkeepers of Chinese descent in particular are often targeted by armed robbers, their cash registers emptied and some products stolen. Kourou is the port of departure for those going to the îles du Salut, of which the most famous is Devil's Island. It is also common for many to go up the river in canoes on weekends to camp in the forest. There is a place not far from the town called les Roches Gravées ("The Carved Rocks"), where indigenous art can be seen on the rock walls. The mission at Kourou being abandoned by the Jesuits, the engineers Mentelle and Tugny designed the layout of the future town. This resulted in the neighbourhood called the Bourg, around the Church of Saint Catherine and next to the port on the river. The small town, surrounded by marshes and rainforest, was unprepared for such a massive influx of people, and around 6,000 of the pioneers died within the year due to fevers and other illnesses. Those remaining fled to the îles du Salut, free of mosquitoes due to constant winds, to recover before being repatriated to Metropolitan France. Hence the name, "Salvation Islands." Previously they had been known as the îles du Diable ("Devil's Islands"), and one of the islands retains the name to this day. The failure of the Expedition only served to discourage settling in Guiana. The colony earned the nickname Enfer Vert ("Green Hell"), which it is still trying to shake. No other project of mass colonisation was undertaken, and the population of Whites was always drastically lower than that of the slaves. The population of the colony, of all races, did not rise above 20,000 until the gold rush (starting in 1855), the second abolition of slavery in 1848 and the founding of the prisons. Kourou was formerly the home of the "Kourou Prison" which was one of the main prisons in French Guiana, and which was also a part of the notorious Devil's Island Prison System. The Kourou Prison was dedicated mostly to agriculture. In 1852 the three main islands off of Kourou's coast, the Salut island group (which included Devil's Island) also became prisons. These island prisons held mostly political prisoners , as well as some of France's toughest criminals. The first prisoners arrived in 1862. 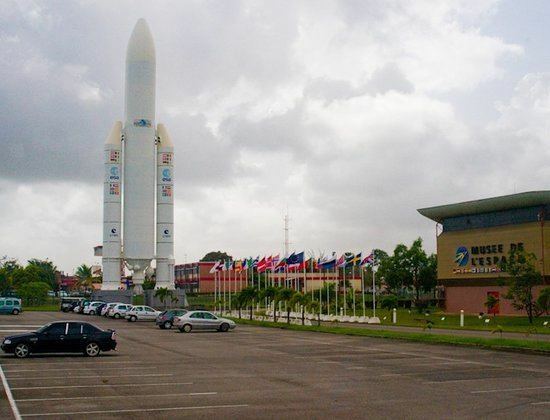 Kourou's economy is largely dominated by the CSG, from which the European Ariane rockets are launched, as well as the Russian Soyuz and the Italian Vega rockets. Kourou is served by the Kourou Airport, located 2 kilometres (1.2 mi) at the west of the city. Kourou is the main town on an "administrative district" of French Guyana. Such as district is equivalent to a county in the United States. The Centre Spatial Guyanais (CSG) gets many visitors all year round. The Musée de l'Espace is a museum devoted to space and space exploration. The Îles du Salut: Of the three islands, only two, Île Royale and Île Saint-Joseph, can be visited. The third is Devil's Island. Les Roches gravées: Indigenous rock art, not far from the small industrial zone called Pariacabo. There are several marked public footpaths in the jungle, of which the most well-known and used is the one on the Montagne des Singes. Kourou River: Many people go up the river on canoes or small boats to camp along the shore in open dwellings, or simply in hammocks. The ocean may not be clear (it is brown due to the Amazonian silt), but both it and the beaches are clean.